A couple of months ago, Federico linked to David Walsh's Medium post detailing HeartWatch, a deeply functional heart monitoring app. HeartWatch, according to Walsh, is a better way to visualize heart rate data pulled from your Apple Watch. Now in version 2.0, HeartWatch looks to be a more all-encompassing aggregator of your heart information. After spending some time with the newest version of the app, I can highly suggest HeartWatch – not only for its capabilities but also for its potential. The most important part of HeartWatch, of course, is its presentations of your heart rate data. Once the app is up and running, you'll see a summary of your day's statistics, including how often your heart rate was at a certain range of beats per minute. 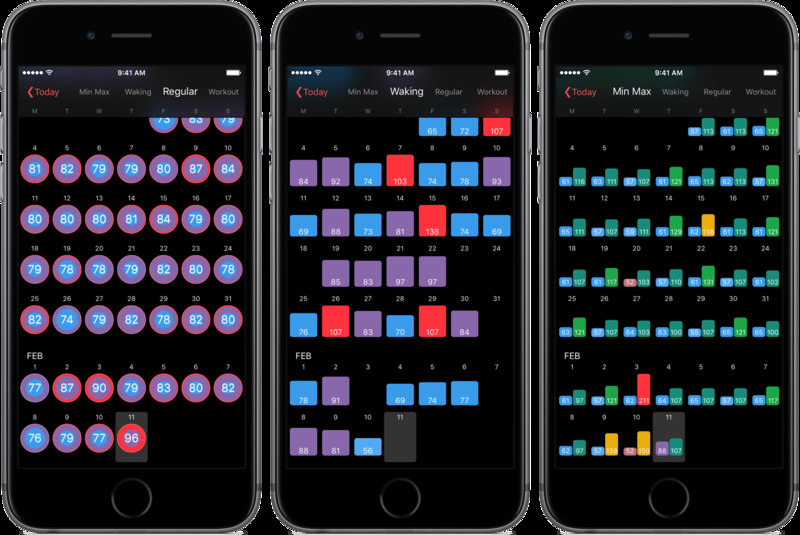 Through colorful graphs of red, purple and blue, you can assess how your regular heart rate has fluctuated throughout the day. In the event of needing to make a note, simply tap "Add a note" and it'll save to that day. 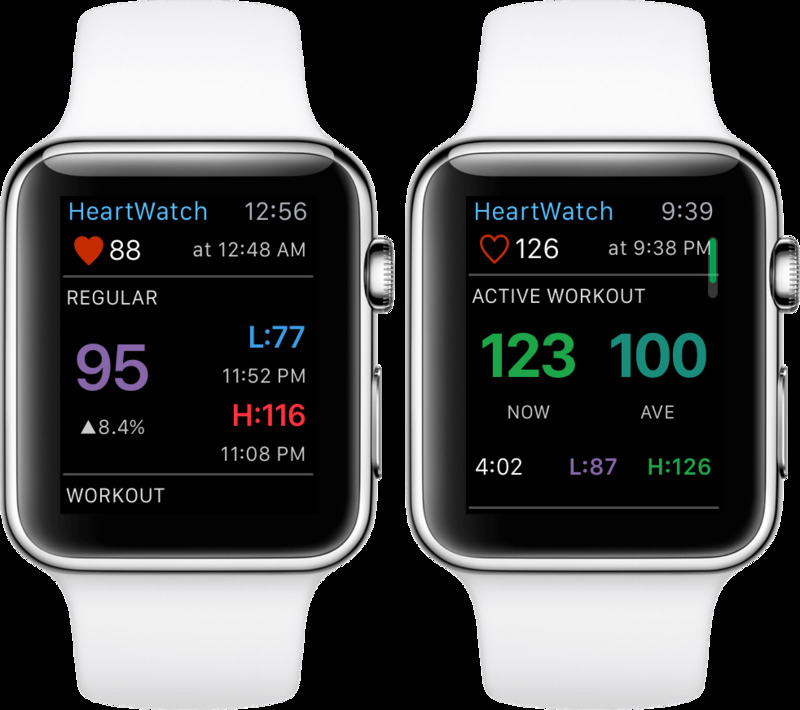 HeartWatch works by taking heart rate readings from your Apple Watch and storing them within the app. I've found that this provides a strong data set and allows me to better understand the changes in my heart rate. If you're looking for a way to view all of the readings taken by HeartWatch, tapping the day's circle will give you the ability to see this information. From my tests, I can verify that HeartWatch reads measurements every 10-15 minutes. 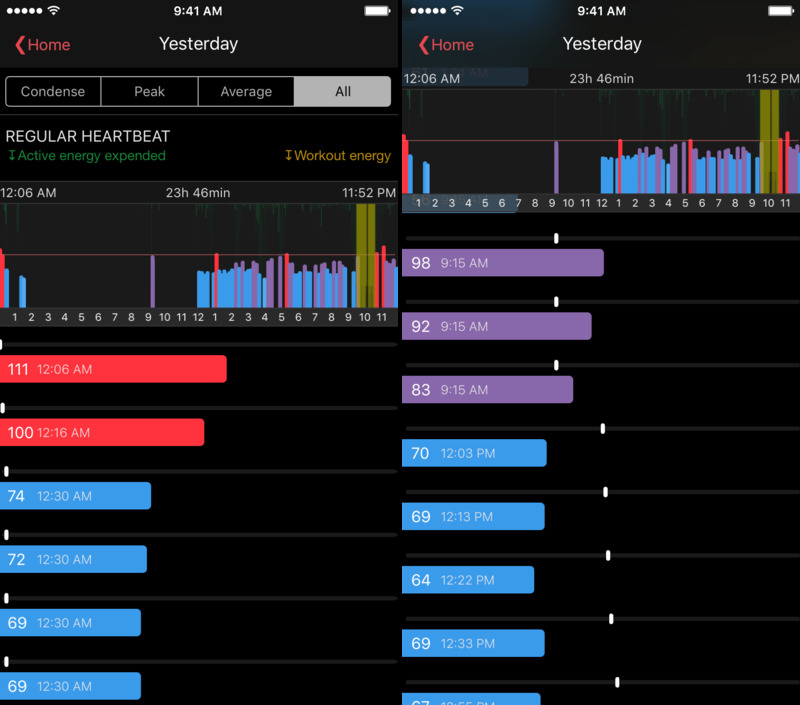 When you first put on your Apple Watch in the morning, HeartWatch will take a reading to log your waking heartbeat. Presented at the bottom of the daily view, these readings are displayed by the week and change color based on where your heart rate landed among resting, high resting, and elevated. HeartWatch doubles as a sleep tracker, too, by reading your pulse overnight and detailing how you've slept. In a similar fashion to the regular heart rate monitoring, you can see the graph and percentages from the night before. There's also a "sleep recharge" section, which shows your body's "battery" and how much you've charged it based on the night's sleep. To better track your heart rate while working out, HeartWatch uses the workout app of choice on your Apple Watch to begin a workout reading. 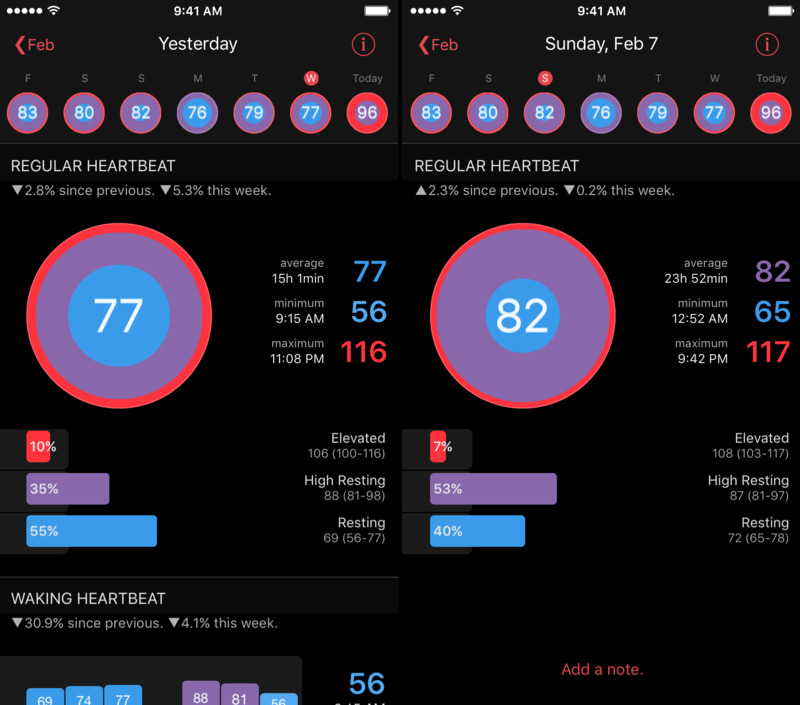 After taking your readings, HeartWatch will then organize your statistics into a colored circle (with different colors than above) and show your percentages. What's most interesting about this is the categorization of what your beats per minute mean – essentially, if you were building fitness, burning fat, or warming up. For the sake of comparison, included below both the regular and waking heartbeat titles are percentages. Along with arrows indicating the change, these numbers show how your heart rate has differed from the previous day and week. If, for example, you are having an uncommonly stressful week, you'll be able to make that comparison here. HeartWatch's data is wrapped together in a beautiful interface that is overwhelmingly comprehensive. When tapping on the month at top left of the screen, you'll get an overview of how your heart rate has looked throughout the previous few months. In a great move, HeartWatch lets you change the view you want to see, whether that's waking, regular, workout, or minimum and maximum heart rate. Instead of being stuck with a simple calendar, you can get a broader view of your activity by switching tabs. HeartWatch includes multiple settings, most of which are customizations you can make to how the app works. Specifically, if you need to change number sections around, take a look into this. Additionally, you can peak in and set notifications to a certain time and heart rate and get some tips or help if there's any confusion. Rounding out the HeartWatch experience, an Apple Watch app and complication have been included to help you view your information on the go. When in the app, you'll see similar daily stats of your heart rate. Current heart rate, average beats per minute, and highs and lows make an appearance, providing you with a more comprehensive way to see how your heart has performed. 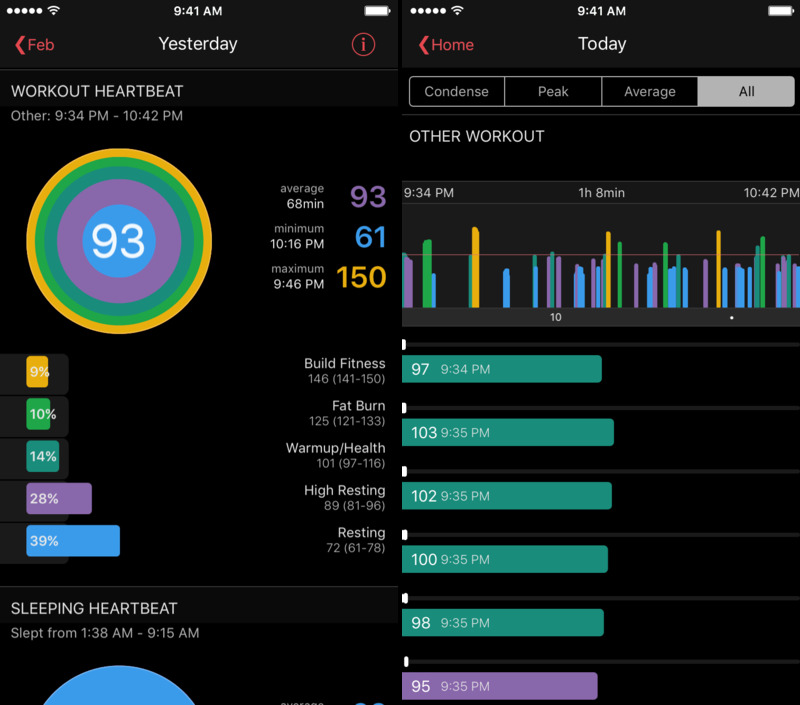 When you're working out, you can view your current and average heart rate for comparison. There's also a timer at the bottom, so you can see how long you've been active without heading into another app. 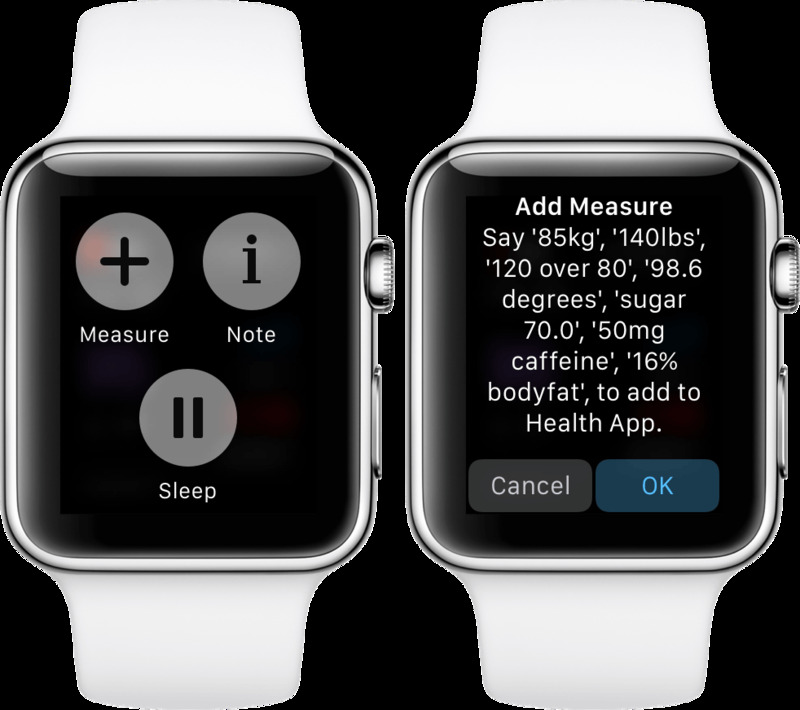 In a pinch, HeartWatch can be used as a channel to HealthKit using voice dictation. By pressing on the screen and tapping "Measure", you're able to speak into the microphone and log important metrics. Although I'm not much of a HealthKit user, this will be very convenient for those who need to quickly insert some data. With the complication, you can display your heart rate and direction of change directly on your watch face. From all indications, this updates every time your watch takes a reading through the app, so you'll be able to see a change throughout the day. HeartWatch's potential could be, in all actuality, life-saving. By providing a way to closely monitor your heart's fluctuations and health, you may be able to detect early issues and speak to a doctor. But even if your daily use of HeartWatch is just to view some basic statistics, it does its job as a way to do that. There's a lot going on in HeartWatch – on occasion, I got lost in all of the data, diagrams, and information. In future updates, I'd like Walsh to clean up the interface a bit to make the app easier to use. But the beauty of what I mentioned above is that in HeartWatch's case, more really is better. It's tough to find an app that is as comprehensive in its readings as this one and you'll appreciate that if you fall into its target audience. HeartWatch, intentionally or not, is a showcase of what the Apple Watch can do when its metrics are used correctly. While I can't recommend you pick up an Apple Watch just to use this app, I highly recommend those who have one to give HeartWatch a chance. HeartWatch can be found on the App Store for $2.99 (iPhone only). For previous purchasers of the app, it is a free upgrade.